Lying between the rivers Rhône and Arve, at the foot of a Genevan Energy Services station that would be better suited to house a swiss Bond villain, the Pointe de la Jonction is a calm and beautiful place. It is the exact point where the two rivers in Geneva merge to form only one. 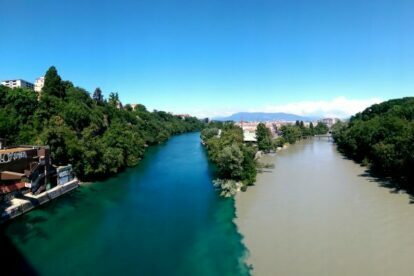 By some black magic (it is more than probable that it is due to the temperature difference between the rivers), the waters of the Rhône and the Arve don’t actually mix for a while after that, so what is left is a brown and green two-tone river that is mesmerizing. The very edge of the point is accessible on foot from either side of it, the left being more fun, because as soon as the sun comes out in the spring, throngs of locals converge to the spot to bathe, grill meats and enjoy some drinks. The city of Geneva also provides some showers and a bar, to make the whole experience a delight. If you feel like a hike, you can also see this from atop a small railway bridge located a few meters after the point. It’s easy to find, there are signs aplenty, and an adorable little café at one end of the bridge.